It was September 2001. I was home in Hot Springs, Ar. about 8pm when I noticed I was beginning to panic. I’d had one or two panic attacks in the past, and they’d always passed so I really didn’t think much of it, cooked my dinner (of unhealthy foods including fatty meats, canned veggies and cow’s milk); a typical meal for me at the time. Within an hour I was in full panic mode. Nothing externally was scaring me. My dog was there by my side, nobody was trying to break in, I was just frightened. My chest did not hurt but my breathing was heavy and I could feel some pain in my lower back. Finally I called an ambulance. Glad I did. I had suffered a major heart attack and before I knew it they were performing angioplasty at National Park Medical Center. I was not put totally under but enough to (allegedly) not be able to think very well. My body/soul did one of those things I’ve read in books and magazines but never really took too seriously. It left my body and I was floating around the room looking at my limp body. I could see a tunnel in the ceiling and decided to visit whatever was there. I had enough sense about me to know very well this could be some kind of hallucination, but I decided to try it anyway. After all, I’d heard so many reports over the years that near-death and post-death experiences might lead one to heaven and even “visitation rights” to all past loved ones/family members etc. But my visit through the tunnel was nothing like that. It was a huge meadow full of wildflowers with stained cedar picnic table full of all types of healthy looking foods (and some pie and meat). The dominant food was raw and lightly-cooked veggies. I wondered if the universe was trying to tell me something. I “sat” at the table though my body floated a few feet above the bench. I watched and listened as the food had conversations with each other. It was fascinating enough to stick around. It didn’t take long before I could see a cartoon in this picture so I “returned to my body” as the doctors and nurses were performing surgery and I asked one of the nurses for a pen. She asked why I wanted a pen and I said I had a great idea for a cartoon but needed to write it down so I would not forget it. She said it was “against the rules” to write cartoons during surgery but if I would remind her after the procedure, back in my recovery room, she would surely give me the pen. I am sure she felt I’d forgotten about it but I didn’t. When I finally awakened and shook off the anesthesia, I asked her, “Well where is it?” (She’d obviously forgotten). “What?” “My pen. I need a pen to write the cartoon concept”. Rather than have me write it, she took out a notepad and pen and asked me what to write. I dictated it to her as I was in agreement I was probably too weak to write out the concept (which was often a page or two of description and a caption). She did and left it on my night stand. Five or so days later I was released from the hospital. The nice nurse came in to tell me goodbye and reminded me to take the cartoon concept with me and let me know how it turned out. I collaborated with my associate and the cartoon was complete. A month later I took a copy back to National Park Medical Center and took a signed copy to the medical team. They all got a good chuckle out of it and that made me happy. 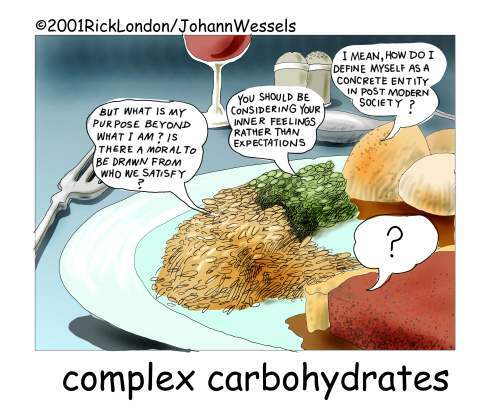 Complex Carbohydrates has been a popular image over the years on gifts, aprons, Tshirts, greeting cards and a lot of other things.